Lately, it seems like several people from different areas of my life have been complaining about, bragging about, or simply talking about their hair. And since one of my favorite past-times is complaining about my overly thick, straight in front but curly in the back hair, I've decided to join the fun. There it is in all of it's witch hair glory. And yes, I am quite aware that I'm really too old to wear it this long. I'm also terribly aware that I desperately need at least the ends trimmed. But if I'm going to bother getting a trim, I'm going to go all out & cut it. Cut it short enough to make a donation to Locks of Love. And if I'm going to cut it, I need to decide how I want it cut. And that takes me back to the need for a grown-up hair do. And I really don't want an age appropriate hair style. Besides, I like being able to wash it, comb it, shake it like a dog and go. I bet an age appropriate hair style will involve at least a blow dryer. And I swore long ago that I'd never go back to using a blow dryer. So, it looks like the witch hair stays. At least for a while longer. On a totally different note, I felt like quite the naturalist yesterday morning. I was sitting out on the front porch having my morning coffee while the mud-daubers swarmed around me. They are determined to cover our porch light with their mud nests and I'm determined that they won't. I kept hearing a weird buzzing noise behind & beside me and finally realized it was humming birds. I've never seen them visit the plants on the porch before. 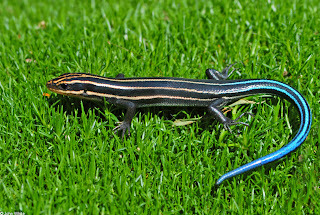 Meanwhile, there were three lizard/salamander things crawling all over the place & occasionally darting between my feet and a rather large turtle crawling across the yard. I'm just glad the local bear didn't decide to come join the party. 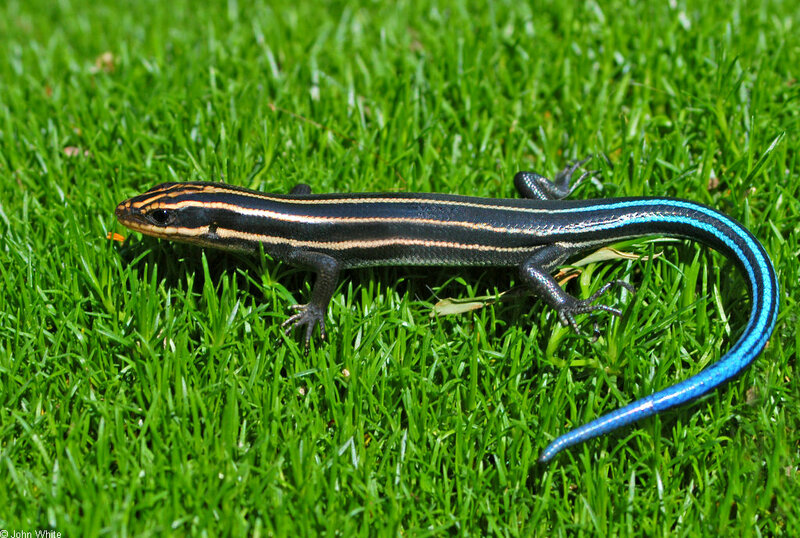 A Southeastern Five Lined Skink, other wise known as a "lizard/salamander thing"
#1 - your hair is gorgeous!